When you have one of Baseball’s elite closers on the mound with a three run lead in the bottom of the 9th, it should be game over. Sadly, it was an off night for Aroldis Chapman as he allowed three runs before being pulled from the game. 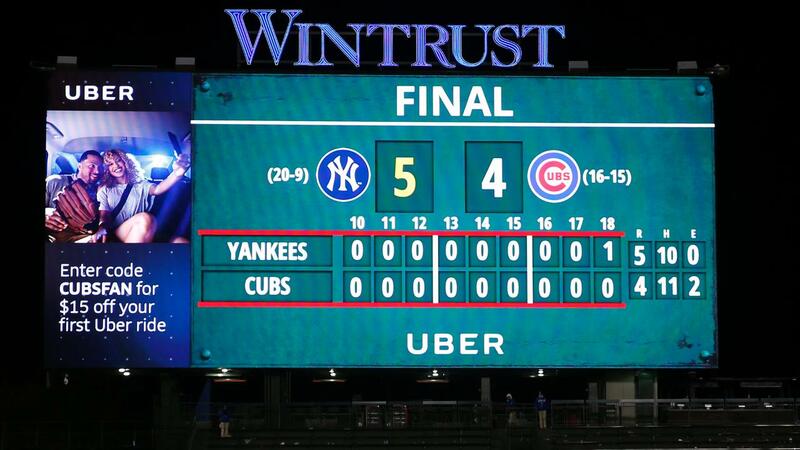 From that point, it felt like it was only a matter of time before the Chicago Cubs pulled off a walk-off. Fortunately, these are not the 2016 New York Yankees. In an 18-inning affair that lasted six hours and five minutes (sorry, I didn’t stay up), Aaron Hicks , Ronald Torreyes and Starlin Castro emerged as the heroes of heroes. 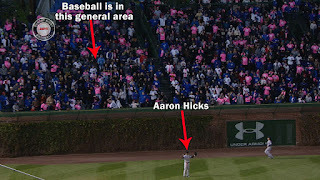 Leading off the 18th, Aaron Hicks bunted toward third and reached second thanks to a throwing error by Cubs catcher Wilson Contreras. After a sacrifice bunt by Torreyes moved Hicks to third, he scored on a grounder to short by Castro. 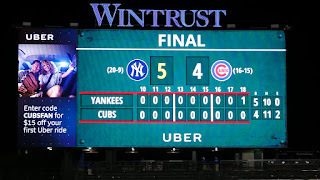 When Chasen Shreve (1-0) struck out Cubs pitcher Kyle Hendricks at 2:13 a.m., the Yankees (20-9) had completed an improbable and very exhausting 5-4 victory. It’s tough to play a night game on “getaway” day, but even tougher to play what essentially equates to a double-header in terms of innings played. It was an incredible job by the bullpen for anyone not named Chapman. Tyler Clippard, Adam Warren, Jonathan Holder and Shreve combined for 9 1/3 innings of scoreless relief following Chapman’s blown save. The Yankees and Cubs set a Major League record for strikeouts with 48. Yankees pitchers accounted for 26 of those K’s, including 9 by starter Luis Severino and 5 by Shreve. The Cubs also set a record by using three pitchers as pinch-hitters. I am thankful the Yankees didn’t have to employ the last man standing in the bullpen (Tommy Layne) given his recent propensity for watching the opponent score while he is on the mound. Chapman’s underwhelming performance against his World Series teammates wasted another great start by Severino. With a four-hitter in 7 innings of work while allowing only a single run (a 2nd inning home run by Javier Baez), he bested former Boston Red Sox nemesis Jon Lester and stood in line for the victory until Chapman let it get away. A run scoring triple by Aaron Judge in the 7th inning had put Severino in position to win, with a two-run homer by Jacoby Ellsbury in the 8th for support. But the Cubs, stealing a page from these exciting young Pinstripers, showed that the game is not over ’til it’s over…to borrow a line from legendary Yankees catcher Yogi Berra. Castro completed his three day Chicago reunion with 2 RBI’s despite an 0-for-8 night. He also had a run-scoring ground-out in the first inning. Matt Holliday did a solid job with his first Yankees start at first base. He went 2-for-4 until he was lifted for pinch-hitter Chris Carter. It wouldn’t surprise me to see Holliday play some more first base in Cincinnati. 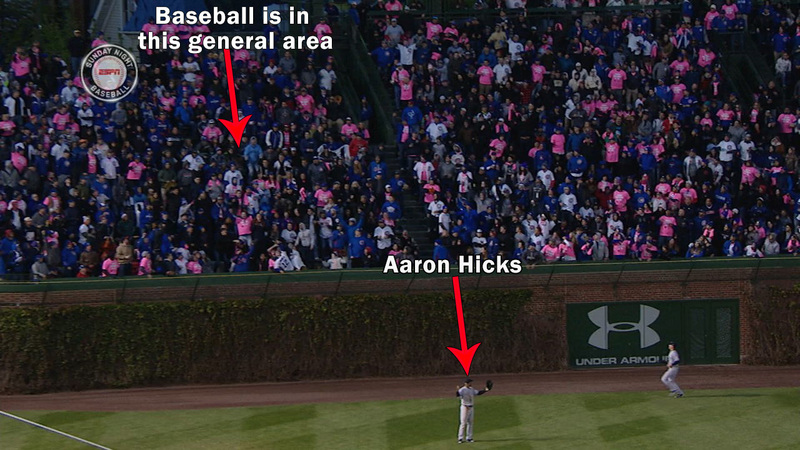 Heck, at this point, the Yankees should probably play Aaron Hicks at first. They have to find ways to keep that dude’s bat in the lineup. For the Yankees, they became only the second team to sweep the Cubs this season. They maintained a half-game over the Baltimore Orioles for the AL East lead. The O’s had a broom of their own with a weekend sweep of the Chicago White Sox. Sadly, the Red Sox won again after providing 17 runs for their ace, Chris Sale. The Yankees make a short hop to Cincinnati, Ohio for a game against former Yankees top pitching prospect Rookie Davis and the Cincinnati Reds later today. I would generally say that the Yankees may be a little sluggish after the late night, but that would be underestimating the resiliency of this team. It will be a challenge as the Reds (17-14) are the current leader in the NL Central, thanks to the Yankees’ sweep of the Cubs. But if any team can find a way, I’ll take my chances with the Yankees. Have a great Monday! Hopefully we’re in line for a restful and victorious day!